Anoxia, not the ‘disease” but the Metal-group, are a band from Mexico with members involved with e.g. Remains (on March 4th 2016 I did upload the review for their album Evoking Darkness), Dew Of Nothing or Cryptogeny. 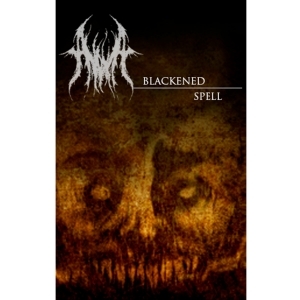 This new collaboration debuts with Blackened Spell, which initially got released on tape via Locust Amber Records, the Black Metal side-label of Legs Akimbo, and on CD little later via Mexican Concreto Records. The recording was done in Summer 2015 at the MAT Studio with productional and mastering duties taken care of by the band’s guitar player Miguel Angeles. The band brings an energetic form of Traditional Black Metal, which presents a fine-tuned balance in between rhythm and melody, and in between aggression and elegance. Most pieces are fast and pounding, based on guitar-oriented structures, and supported by quite a colossal rhythm section. Every track exhales a certain grandeur that once again refers to the scene from the Nineties, especially the European one in general, and the Scandinavian one more specifically. I for sure have no problems with that aspect, especially because the sound quality convincingly lifts up the whole experience by being created with the right production: little rough and unpolished, yet with a well-balanced mix. And it might be a cliché in mean time, but for the 100th time this month I cannot but pay respect for the sublime song writing at the one hand, and the impeccable performance at the other. There is quite some power and heaviness involved, and especially several songs on the B-side are quite technically executed. Question might be: can another piece, despite being ‘all right’ in sound, composition and execution, deserve attention. For me the answer is easy: yes! It’s not because it has been done a couple of thousand times before, that this effort does not need support or appreciation.